REST APIs have been the standard for building web APIs for the past decade. In 2015, Facebook introduced a new and open-source query language for APIs that comes with notable advantages compared to REST: GraphQL! Since then, many developers want to start using GraphQL but are stuck with their legacy REST APIs. 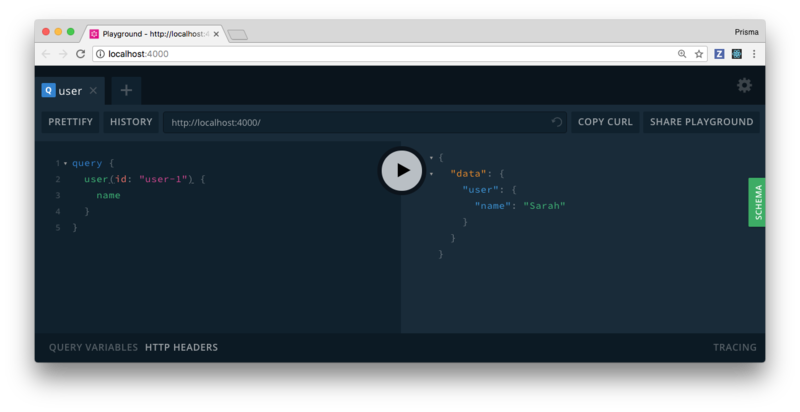 In this article, we’re going to introduce a lightweight process for turning REST into GraphQL APIs. No special tooling required! One of the biggest drawbacks of REST APIs is that they don’t have a schema describing what the data structures that are returned by the API endpoints look like. Now, you’re flying completely blind. If the person who designed the API is sane, it is probably safe to assume that it will return an array of some kind of user objects — but what data each of the user objects actually carries can in no way be derived just from looking at this endpoint. Note that there are ways how this problem can be solved for REST APIs, using tools like JSON Schema or Swagger / Open API Spec. When using GraphQL, the core component of each API is a strongly typed schema that serves as a strict contract for the shape of the data that can be queried. In the remainder of this article, you will learn how you can deduce and implement a GraphQL schema from the JSON structure of a REST API. In this article, we’ll take the example of a simple blogging application. Assume there are two models, users and posts. There is a one-to-many relationship between them in that one user can be associated with multiple posts. If you want to play around with this API, you can either check out the code in this repository or directly try out the deployed version of the API. There are effectively two major ways how we can design the data structures to be returned by a REST API: flat and nested. In a flat design, relationships between the models are expressed via IDs that are pointing to the related items. The flat API design might be preferred because its generally more slim than the nested one — however, it’s very likely that your clients will be running into the infamous N+1-requests problem with it: Imagine the client (e.g. a web app) needs to display a view with a list of users and the titles of their latest post. In that scenario, you first need to make a request to the /users endpoint. This will return a list of IDs for the posts related to a user. So, now you need to make one additional request for each post ID to the /blog/posts/<id> endpoint to fetch the titles. Not nice! This is a lot more verbose but avoids that clients run into the N+1-problem. However, the nested approach certainly comes with its own problems! For APIs with larger model objects, bandwidth (especially on mobile devices) is likely to become a bottleneck. Another problematic aspect of this is the fact that clients in all likelihood won’t even need most of the data they’re downloading and thus are wasting the user’s bandwidth — this is referred to as overfetching. Plus, even with the nested approach you’re not always guaranteed to get all the data you need. Imagine posts also had a relation to comments and the screen also needs to display the last three comments for the displayed article. This kind of nesting can go arbitrarily deep and with each level will become more problematic and slow down your app. What ends up happening in practice is that the data that’s returned by the endpoints is designed on the go. This means the frontend team communicates its data requirements to the backend team and the backend team will include the required data in the payloads returned by the endpoints. This introduces a lot of overhead in the software development process. It basically means that every design iteration on the frontend that involves a change in the displayed data needs to go through a process where the backend team is directly involved. This prevents fast user feedback loops and iteration cycles! Not only is this approach extremely time-consuming, it also is brittle and error-prone. APIs that are changing a lot are hard to maintain and clients will have a hard time getting the right data. When fields are removed from certain API responses without the client being aware of it (or maybe the client was simply not updated and is still running against an older API version), there’s a high probability it’s going to crash at runtime due to missing data. Not nice! All the issues that we outlined above, the N+1-problem, overfetching and slow iteration cycles are solved by GraphQL. This works because with GraphQL the client can dictate the shape of the response. It submits a query to the server that precisely describes its data needs. The server resolves that query and returns only the data the client asked for. 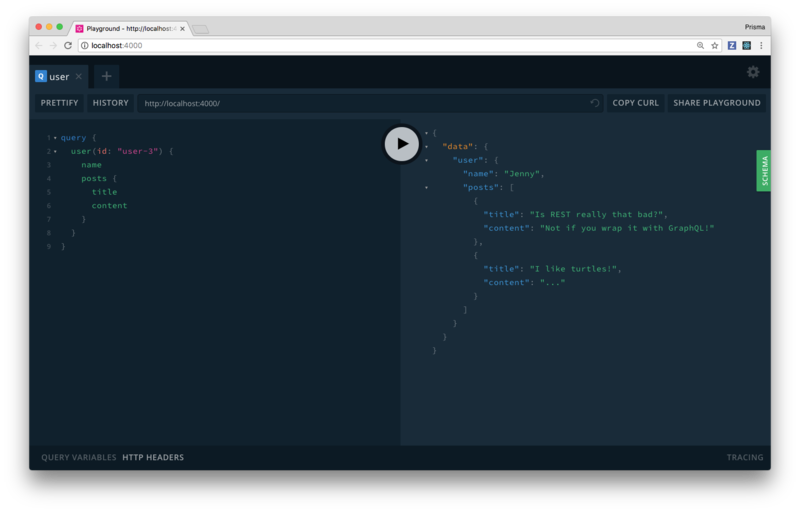 With GraphQL, the client dictates the shape of the response by sending a query that’s resolved by the server. 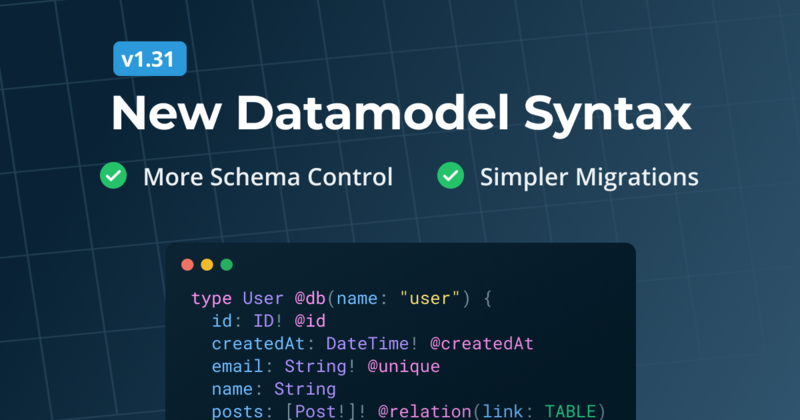 The way how data can be queried is defined in the GraphQL schema definition. Therefore, a client will never be able to ask for fields that don’t exist. Further, a query itself can be nested, so the client can ask for information of related items in a single request (thus avoiding the N+1 problem). Nifty! 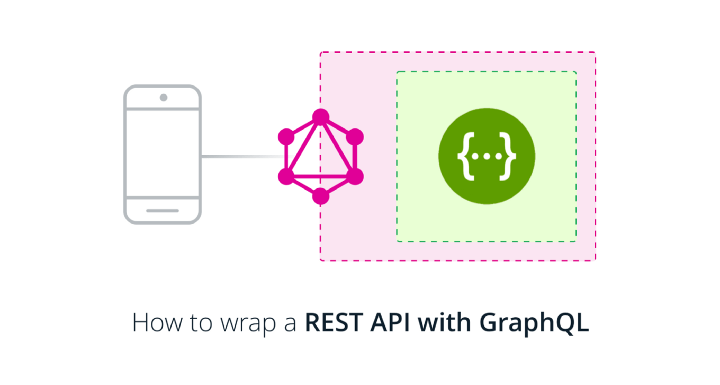 In this section, we’ll outline how you can wrap REST APIs with GraphQL in 3 simple steps. GraphQL is no rocket science! In fact, it follows a few very simple rules which make it so flexible and universally adaptable. In general, building a GraphQL API always requires two essential steps: At first you need to define a GraphQL schema, then you have to implement resolver functions for that schema. The nice thing about this is that it is a very iterative approach, meaning you don’t have to define the entire schema for your API upfront. Instead, you can gradually add types and fields when necessary (think about it in a similar way of gradually implementing the REST endpoints for your API). This is precisely what’s meant with the term schema-driven or schema-first development. GraphQL resolver functions can return data from anywhere: SQL or NoSQL databases, REST APIs, 3rd-party APIs, legacy systems or even other GraphQL APIs. 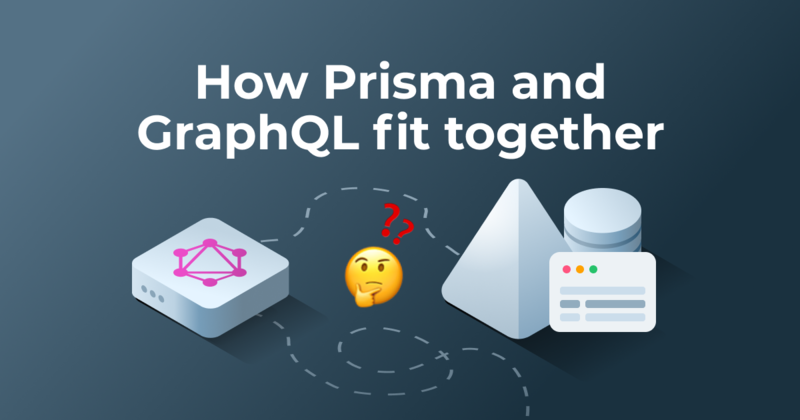 A huge part of GraphQL’s flexibility comes from the fact that GraphQL itself is not bound to a particular data source. Resolver functions can return data from virtually anywhere: SQL or NoSQL databases, REST APIs, 3rd-party APIs, legacy systems or even other GraphQL APIs. Let’s go through each of these steps, using the REST API from before as an example. The first thing you need to understand is the shape of the data that’s returned by the different REST endpoints. The User model has id and name fields (of type string) as well as a posts field which represents a to-many-relationship to the Post model. The Post model has id, title, content (of type string) and published (of type boolean) fields as well as an author field which represents a to-one-relationship to the User model. The SDL syntax is concise and straightforward. It allows to define types with fields. Each field on a type also has a type. This can be a scalar type like Int and String or an object type like Post and User. The exclamation point following the type of a field means that this field can never be null. The types that we defined in that schema will be the foundation for the GraphQL API that we’re going to develop in the next step. Each GraphQL schema has three special root types: Query, Mutation and Subscription. These define the entry-points for the API and roughly compare to REST endpoints (in the sense that each REST endpoint can be said to represent one query against its REST API whereas with GraphQL, every field on the Query type represents one query). In this article, we’ll go with the first approach since it illustrates well the mechanisms you need to apply. Deducing from it how the second approach works should be an instructive exercise for the attentive reader. Don’t worry, we’ll show you in a bit how you can actually send that query. As for the /users/<id>/posts endpoint, we actually don’t even need it because the ability to query posts of a specific user is already taken care of by the user(id: ID! ): User field we just added. Groovy! This is it — we have now created the schema definition for a GraphQL API that is equivalent to the previous REST API. Next, we need to implement the resolver functions for the schema! In this tutorial, we’re only dealing with queries, i.e. fetching data from the server. Of course, in most real-world scenarios you’ll also want to make changes to the data stored in the backend. With REST, that’s done by using the PUT, POST and DELETE HTTP methods against the same endpoints. Note that the createUser, updateUser and deleteUser mutations would correspond to POST, PUT and DELETE HTTP requests made against the /users/<id> endpoint. Implementing the resolvers for mutations is equivalent to implementing resolvers for queries, so there’s no need to learn anything new for mutations as they follow the exact same mechanics as queries — the only difference is that mutation resolvers will have side-effects. GraphQL has a strict separation between structure and behaviour. The structure of an API is defined by the GraphQL schema definition. This schema definition is an abstract description of the capabilities of the API and allows clients to know exactly what operations they can send to it. The behaviour of a GraphQL API is the implementation of the schema definition in the form of resolver functions. Each field in the GraphQL schema is backed by exactly one resolver that knows how to fetch the data for that specific field. To learn more about the GraphQL schema definition and resolver functions, be sure to check out this article. For the user and post resolvers, we’re also extracting the id argument that’s provided in the query and include it in the URL. 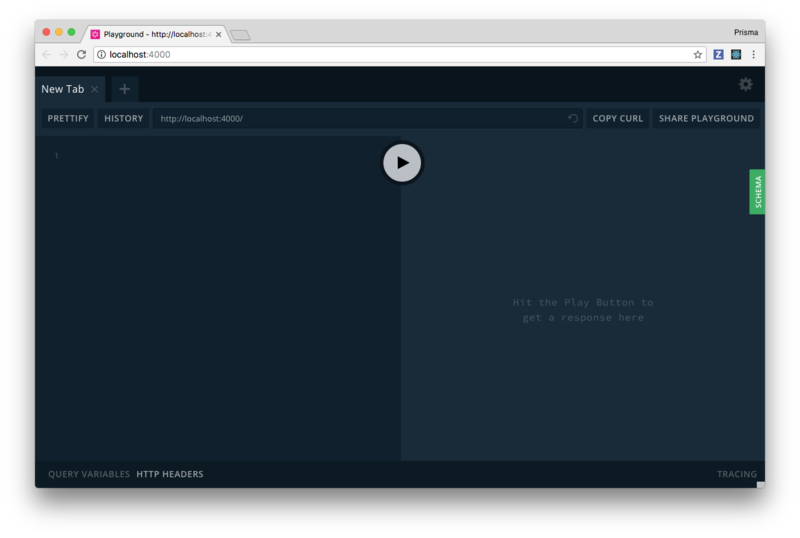 A GraphQL Playground is a GraphQL IDE that let’s you explore the capabilities of a GraphQL API in an interactive manner. 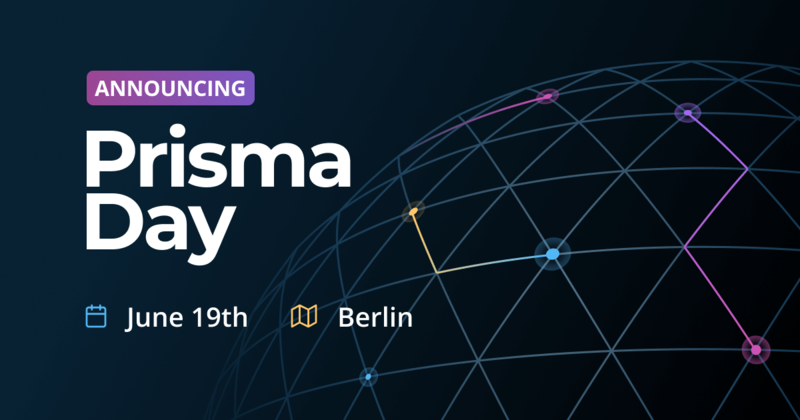 Similar to Postman, but with many additional GraphQL-specific features. In there, you can now send the queries we saw above. Awesome! You can now add fields of the User type to the query as you like. The resolver only returns the data it receives from the /users/<id> endpoint and because we’re using the flat version of the REST API, there are no associated Post elements! So, one way out of that problem would be to use the nested version — but that’s not what we want here! The implementation of the resolver is bug free and you can nest your queries as you wish. Pleasing! Great, this is it! 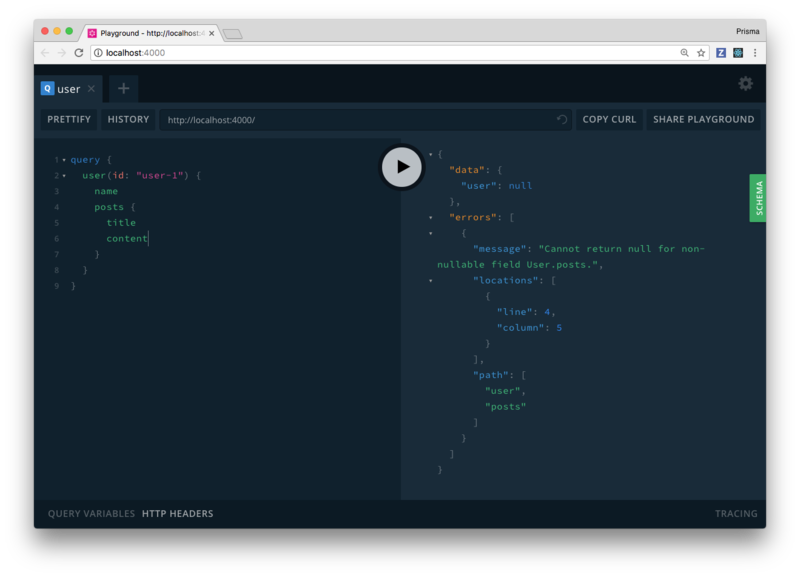 You successfully learned how to wrap a REST API with GraphQL. If you want to play around with this example, you can check out this repository which contains the full version of the GraphQL API we just implemented. In this article, we really only scratched the surface of what’s possible with respect to wrapping REST APIs with GraphQL. Therefore, we briefly want to provide a few pointers regarding more advanced topics that are commonly dealt with in modern API development. REST APIs usually have a clear pattern for authentication and authorization: Each API endpoint has certain requirements with respect to the clients that are allowed to access it. The incoming HTTP request usually carries an authentication token that authenticates and identifies a specific client. Depending on whether that client has the correct access rights for the endpoint it requested, the request will succeed or fail. Now, when wrapping a REST API with GraphQL, the incoming HTTP request that’s carrying the GraphQL query needs to have a token as well. You would then simply attach the token to the corresponding header when calling out to the underlying REST API. 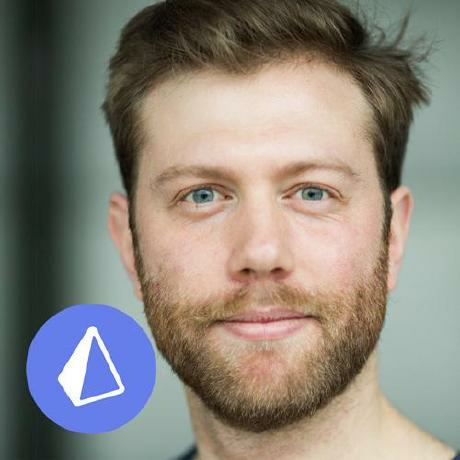 If you’ve paid attention throughout the article, you might have noticed that by wrapping the REST API with GraphQL, we only shifted the N+1-requests problem from the client- to the server-side: Initially, our client had to make N+1 requests with the flat REST API design; when the API was wrapped with GraphQL, the client could send a single GraphQL query to ask for the nested data — however, the GraphQL server still needs to make all the REST calls that were initially done by the client. In general, this is already an improvement because that amount of requests will hurt a lot more if they’re sent from the client-side (e.g. on a shaky mobile connection). The machinery we have on the server is much more appropriate to perform that kind of heavy lifting! Additionally, if the REST API and the GraphQL server are deployed in the same datacenter or just the same region, there’s effectively no latency! To improve performance further, you can introduce parallelization using the Data Loader pattern. When using that approach, resolver calls can be batched with dedicated batching functions which would allow to retrieve the required data in a more performant way. In modern applications, realtime updates are becoming a common requirement. GraphQL offers the concept of GraphQL subscriptions which allow clients to subscribe to specific events that are happening on the server-side. In the same way that GraphQL can represent the standard HTTP methods with queries and mutations, it’s also possible to wrap a realtime API (e.g. based on websockets) using GraphQL subscriptions. We’ll explore this in a future article — stay tuned! Wrapping REST APIs with GraphQL is probably one of the most exciting applications of GraphQL — and still in its infancy. The process explained in this article was entirely manual, the real interesting part is the idea of automating the different steps. Stay tuned for more content on that topic! If you’d like to explore this area yourself, you can already check out the graphql-binding-openapi package which allows to automatically generate GraphQL APIs (in the form of a GraphQL binding) based on a Swagger / Open API specification.